USA Warehouse in United States, so. 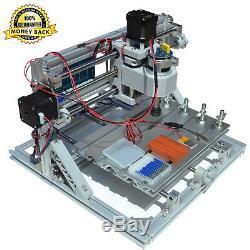 3 Axis USB 2418 GRBL Control mini DIY CNC Router Milling Laser Machine. 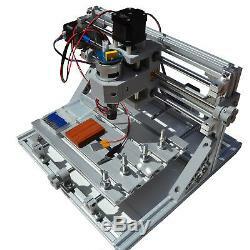 1set GRBL 2418 CNC Laser machine kit (without laser). 10PCS x 20°0.1mm drill bits. Notice: The machine for a full set of spare parts, shall be installed by the buyers, the package include the CD , with detailed user manual and free software, buyers dont need to worry about machine Assembly. Brand New and High Quality! 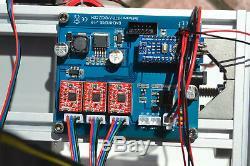 Body used profiles and plastic, small size, light weight, USB interface, GRBL control system, learning, entry preferred. Can use carving knife, but also can use laser engraving. 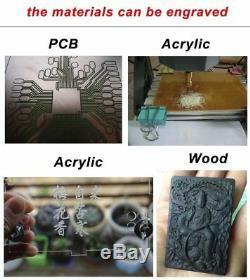 Can engrave plastic, wood, acrylic, pvc, pcb, wood and the other similar material. 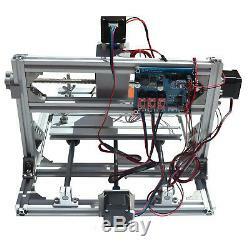 Specification: Working area : 240x180x50mm Frame size : 340x340x300mm Spindle : 775 spindle motor (12-24V) 24V: 12000r/min Spindle Chuck: normal Step motor : Fuselage length 34MM, Current 1.33A, 12v. Torque 0.25N/M Power supply : 12V-24V 5A (100v-240V) Software : bachin master or GRBL controller Support System: Windows XP / Win 7 / Win 8 / Win 10/ MacOS(only candle) Drill bits: tip 0.1mm , 20 degree , diameter3.175mm. 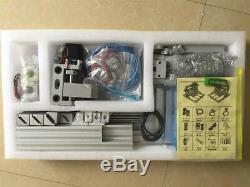 The package include 10pcs Body used profiles and plastic, small size, light weight, USB interface, GRBL control system, learning, entry preferred. 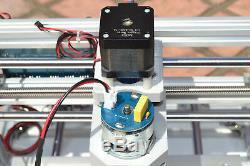 Laser module not included Can be engraved plastic, wood, acrylic, pvc, pcb, wood and the like material. 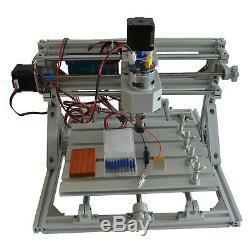 Package Include: 1PCS CNC Router Machine, 10PCS Mill Engraving Bits, 2PCS Limit switches, Laser module not included. USA, United Kingdom, Canada, Australia, New Zealand, Belgium, Netherlands, Luxembourg, Italy, Germany, France, San Marino, Austria. Sweden, Switzerland, Poland, Bulgaria, Slovenia, Slovakia. Roumania, Lithuania, Hongkong, Taiwan, Janpa, Korea, Singapore, Tailand. If your country not in this range. Due to variation of postal service in different areas. Please give us the opportunity to resolve any problem when you have, we concern your problem and we will try our best to resolve it. When you have the parcel, and not satisfied the goods or it is other problem like as broken, pls tell us the detail reason and provide the photos. Item must be in it's original condition and no physical damage. Customers satisfaction is very important to us. 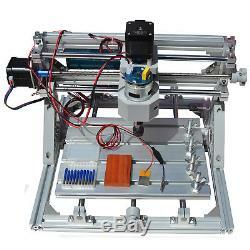 The item "DIY CNC Router Kits 2418 GRBL Control 3 Axis Carving Milling Engraving Machine" is in sale since Friday, June 15, 2018. This item is in the category "Business & Industrial\CNC, Metalworking & Manufacturing\Woodworking Tools & Supplies\Equipment & Machinery\Routers". The seller is "wellxiangxiang2011" and is located in Edgerton, KS. This item can be shipped to United States.